What is the IEEE Women In Engineering Initiative? The IEEE Women in Engineering initiative has been established to promote achievements of women professionals in fields of interest to IEEE. WIE promotes membership growth and elevation of its members. Also, WIE gathers and disseminates information on the status of women in technology and science. For further information about international initiatives on IEEE Women in Engineering take a look at the IEEE WIE website. If you are interested in getting involved with IEEE Women in Engineering contact the IEEE Canada WIE committee chair. The IEEE Women in Engineering Committee (WIEC) encourages development of local activities that adds professional value to IEEE Women in Engineering members to increase the visibility of women in the profession. For this purpose, IEEE WIEC invites IEEE WIE Affinity Group Officers/Society Officers to submit Special Funding requests to bid for special funds. Congratulations to IEEE Canada WIE Members and Group winners! IEEE WIE Membership is offered to ANYONE who has an interest in promoting women engineers and scientists – within both IEEE and the engineering profession. Networking – “who you know” is invaluable! The deadline for receiving nominations is March 15. Nominations are being sought to recognize female IEEE Canada members who received their first professional degree within the last ten years and who are active in IEEE activities. For more information and a link to the online nomination form, please view IEEE Canada Women In Engineering Prize. 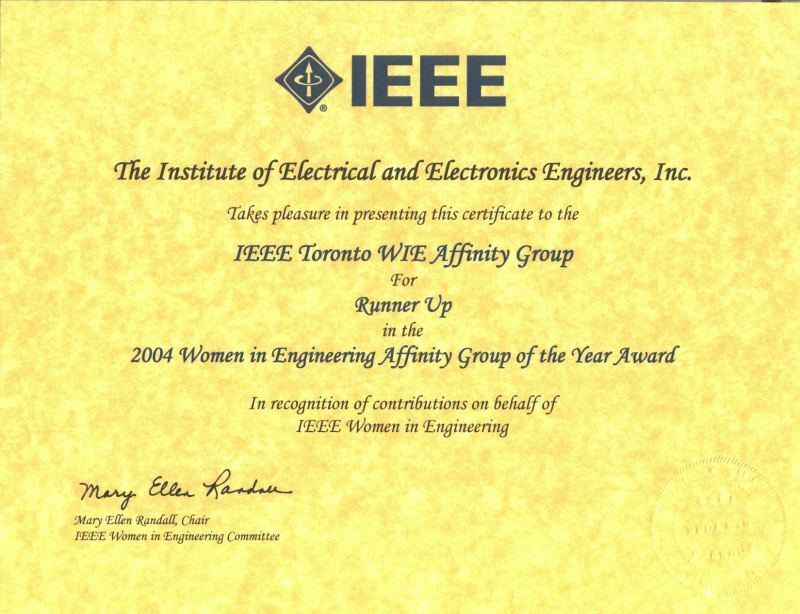 The Group of the Year Award is an annual award that recognizes those IEEE WIE Canada Affinity Groups and SB Groups that have shown outstanding leadership and initiative in organizing activities. There are two Group of the Year Awards; one for large sections and one for medium-small sections. First place recipients receive CAD$400 to support further WIE activities. The mission of the R7 WIE committee is to investigate how IEEE Canada can provide more value to its WIE members and provide direction on how to best realize that value with respect to training and support.